I am by nature a collector, but I can’t say I really care about having originals or first editions: I like having everything produced by Edward Lear, for example, but late editions of his books are all right with me, provided they are faithful to the originals. While I have first editions of the three later nonsense books, for instance, I have never thought of investing a small capital to obtain an early edition of the Book of Nonsense: these are things for libraries, and getting to see the 1855 edition at the National Art Library last March was instructive and a pleasure, but I really feel no drive to acquire a copy. 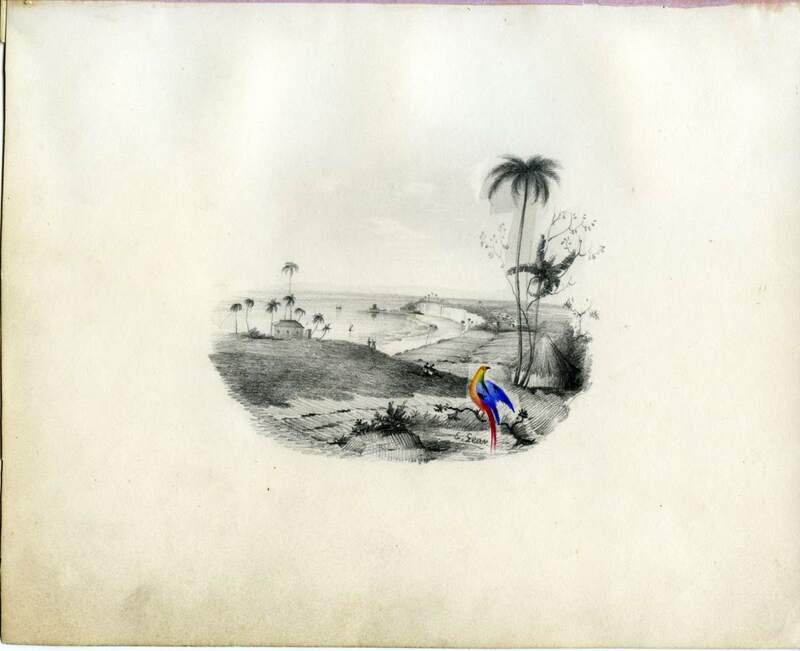 This entry was posted in Edward Lear and tagged Edward Lear, landscape, zoological illustration. Bookmark the permalink. Great find! Love the colorful bird against the b/w background. A treasure indeed! Very much enjoying your blog, esp. The peter newellstuff as well as lear of course!